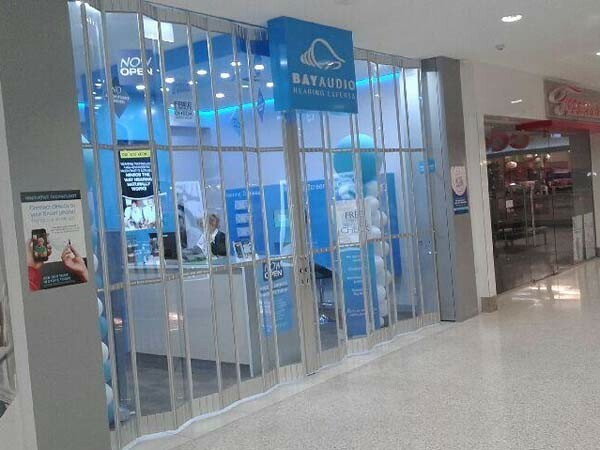 Bay Audio, a leading independent Australian company specialising in hearing technology, has selected The Australian Trellis Door Company (ATDC) as the exclusive folding door supplier for their national store rollout. Bay Audio operates a network of 48 retail outlets nationwide. The company has undertaken a major nationwide store rollout including 22 new stores in 2017. The specifying architects on the rollout are AHB Architects Pty Ltd while Kingdom Projects is responsible for project management and fitout. Featuring an aluminium construction, ATDC’s folding doors are suspended from a heavy duty extruded top track and operate through a series of interlocking heavy duty hinges and rollers, allowing the curtain to effortlessly move and fold to the side and stack neatly and compactly into the storage area. A series of seamless up/down locking mechanisms allows for easy lockup without the need for any cumbersome removable mullions. Key features of ATDC’s commercial folding doors include wide body (300mm) or slimline (150mm) panels; multiple infill mesh options such as polycarbonate, aluminium, toughened glass, aluminium vertical rods or perforated mesh; and high quality premium matt natural anodised finish with a wide range of powder-coated options from Dulux. ATDC’s premium folding doors are now sold in Sydney, Melbourne, Brisbane, Adelaide, Perth, Canberra, Darwin, Newcastle, Geelong and all other regional capital cities across the country. The folding doors are ideal for securing shopfronts, shopping centres, banks, countertops, serveries, hotels, clubs, restaurants and doorways.